Bagel dogs. Who ever thought you would be so good? Hot dogs wrapped in low carb Fathead pizza crust dough and baked in the oven until golden brown. Why have I not made you before? I saw the original recipe for everything bagel dogs on The Primitive Palate about 2 years ago. Honestly, I looked at them and said, “Meh.” I’m just not a big hot dog person. I’ve HAVE been known to eat a low carb corn dog on occasion. I even have a recipe for them on the blog which I published over two years ago. They’re low carb and gluten free, but call for cornmeal in the batter for that authentic corn dog taste. But I was talking about bagel dogs. I’d never heard of a bagel dog until moving to California 20 years ago and discovering Einstein Bros. Bagels. 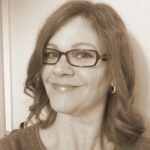 As a freelance Sign Language Interpreter, I found myself working all over San Diego County during the course of a day. I often had to find a quick bite to eat before my next assignment and bagels were my favorite snack. I admit that I turned my nose up at the concept of bagel dogs at Einstein Bros. Bagel. Crazy, I know! A few weeks ago my kids wanted hot dogs for dinner and were upset when I said that I didn’t have buns for their dogs. Instead of running to the store I whipped up a recipe of low carb fathead pizza dough in 3 minutes flat. Then, I divided it into 8 pieces, rolled each piece into a snake, wrapped a snake around each hot dog, then rolled them on the counter to smooth out the dough. In the oven they went until golden brown. If you haven’t tried the original low carb Fathead pizza dough, I highly recommend it. It’s made from regular ingredients and is fast and easy to make. I tweaked the recipe to get a truer bread consistency from the dough. I add a little more cream cheese and some protein powder. My dough is sticker, but I feel better. It was perfect for these low carb bagel dogs. I originally spent a lot of time testing the low carb pizza dough with various ingredients to get what I thought was the best tasting and textured dough. The whey protein powder was the best version followed by oat fiber, coconut flour and last, additional almond flour. I feel that this is the best version and I love it. 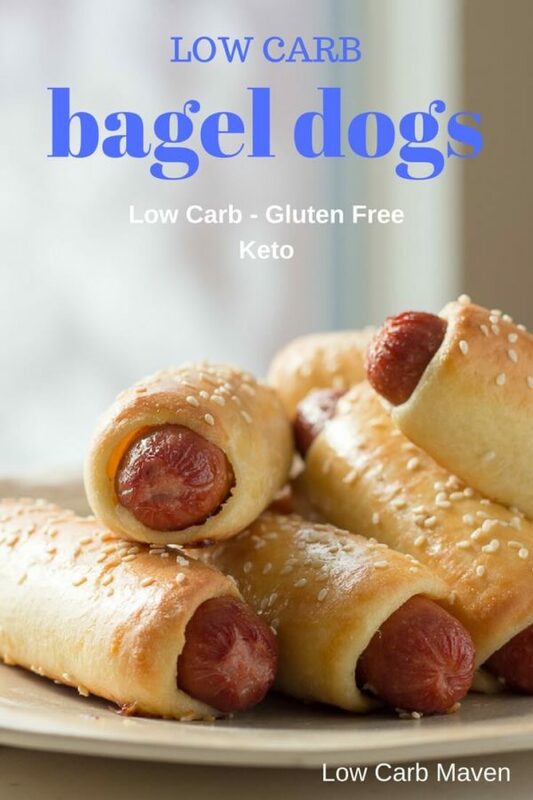 Each Low Carb Bagel Dogs or pretzel dogs is 4 net carbs each! These low carb Bagel Dogs or pretzel dogs are easy to make with the Fathead pizza crust recipe. Just wrap, roll, and bake. The perfect low carb or keto lunch, snack, or meal. Place rack to the middle position of the oven. Line a cookie sheet with parchment. Remove the hot dogs from their package and place them on a paper towel. Dry them off. Beat the extra egg with water for the egg wash.
Add the mozzarella cheese to a medium microwaveable bowl. Cut the cream cheese into small pieces and add to the mozzarella cheese. Microwave for 1 1/2 minutes on high power. Stir. If the cheese hasn't melted, cook for an additional 20-30 seconds more. Put the cheese in a food processor and add the egg. Process until smooth. Add the dry ingredients and process into a very sticky dough. PREHEAT OVEN TO 400 F. Scrape the dough onto a piece of plastic wrap, wrap, and place into the freezer while the oven preheats. Keep hands lightly oiled. Divide the dough into 8 equal portions and roll each into a ball. Working with one ball of dough at a time, roll into a snake about a foot long. Starting about 3/4 of an inch from the end of a hot dog, start winding the snake around the length of the hot dog. Place the wrapped hot dog on the work surface and roll back and forth until the dough is smooth. I had about 1/2 inch of the hot dog poking out on each side. Place on the parchment paper lined cookie sheet. Repeat 7 more times. Dip a pastry brush into the egg wash and brush the surface of each bagel dog - don't forget the sides. 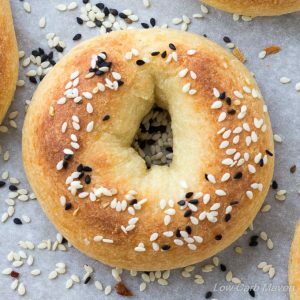 Sprinkle with sesame seeds to add a nice looking texture. Bake for 10-15 minutes or until browned. My dogs plumped up and split the dough on a few of my hot dogs. They were still delicious! 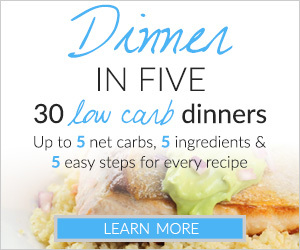 Hi Kim… I want to first thank you so much for all these amazing recipes as they give my husband and I a HUGE edge to help us stick to our low-carb lifestyle! But I have a quick question on this recipe – in the recipe ingredients you list BAKING POWDER but in a previous comment/question by another person you say you added BAKING SODA….which is it? We were so ridiculously pleased with these!! I used lil’ smokies and topped with kosher salt my husbands portion and everything bagel topping on mine. Followed the recipe exactly and used protein powder! You were right about extra sticky; I use nitrile gloves in the kitchen regularly and coated them with oil…. rolled out on silpat and pure perfection!! Dipped in sugar free ketchup and horseradish mustard!!! I can’t give you enough accolades for this one; FANTASTIC!!! No baking powder or soda? Didn’t rise? These are amazing! They are like sausage rolls but tastier and much more satisfying. I will try adding baking powder next time to make it a bit more fluffier but nevertheless, these were quick and easy to make. Thanks! What about xanthem gum instead of the oat fiber or whey protein? These look really good. 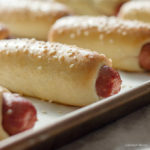 I have a question about rolling them.Do you do a snake wide roll out and then continue to roll around the hot dog or are you only rolling once with a wider dough? Hi! I’m interested in using these for camping, so I can have some tasty buns for my grilled hot dogs. 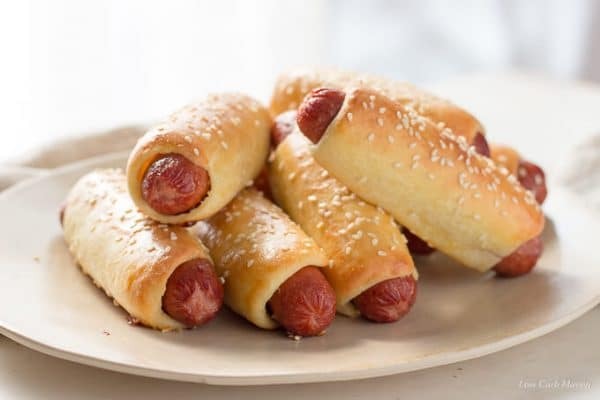 Do you have any recommendation for making them ahead of time (without the hotdogs) so I can bring them with me and just add in my grilled dogs once I’m there? These were so much fun to make. I pretty much always have the ingredients needed, they can be made PDQ and my husband liked them so much I know these will get made often. Thanks for another great recipe. 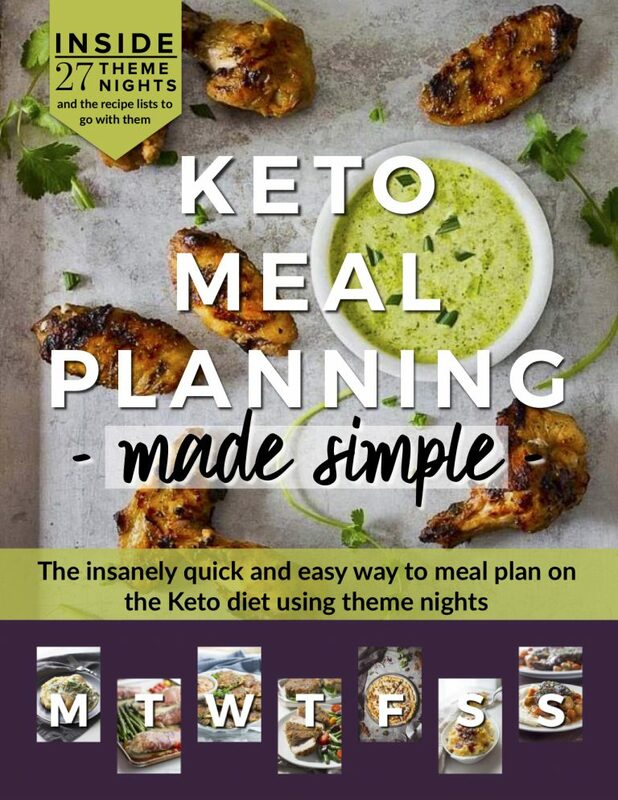 You make living the Keto life so easy. 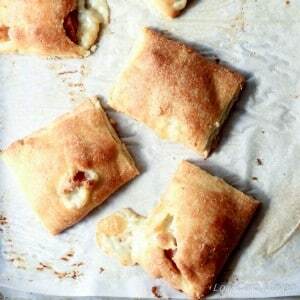 Just used the bread recipe for turkey and cheese hot pockets and they look great! Is the nutrtion value based off of only 1 bagel dog? Wow…these were incredibly delicious. I made them last night for me and my boyfriend. I’ve been doing keto lately, and he just eats whatever I make, the usual. I asked him how they were and he said normal…but in a good way- like they actually tasted like yeasty, bready, high carb pigs in a blanket (which are always delicious) so that’s a win! I can’t wait to make these again honestly, they were that good. I didn’t use protein powder because I didn’t have any, so I added and extra quarter cup of almond flour- came out perfect. How can I substitute the almond flour to coconut flour? I am excited to try your recipes! Just saw it on my husbands Pinterest. Let you know how they come out! Thank you! I always made these before keto so I was sooo excited to see a keto version. 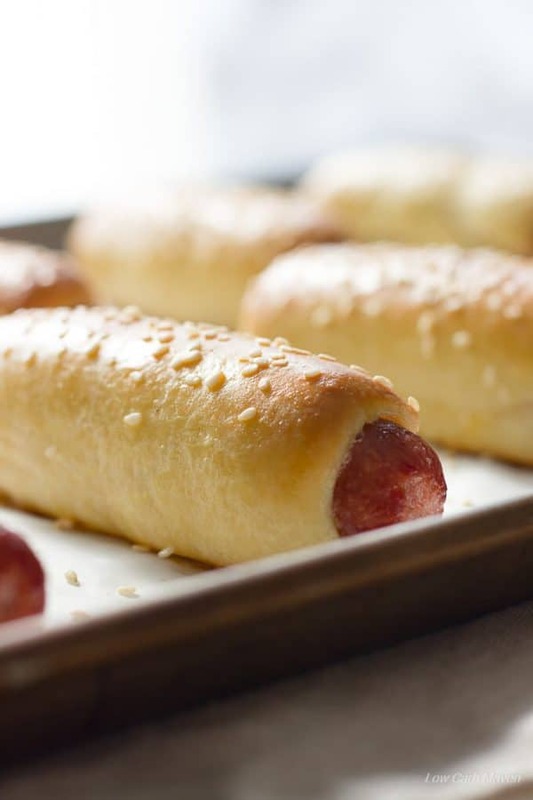 I sliced my dogs and stuffed them with cheese slices before rolling them like I always do with crescent dogs. SO GOOD! Yum!!! Being from Australia i’ll Be honest I have never ever heard for bagel dogs. 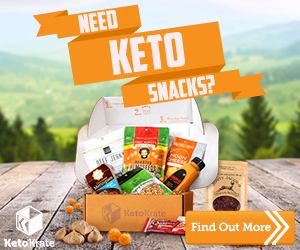 I do have a thing for hotdogs though as was looking for a way to enjoy these on a keto diet….. these worked out amazing! Even my husband who is not into the whole keto thing thought they were fab. That fathead pizza dough is so versatile. Thanks heaps! Love that you mix the dough in the food processor & keeping it in the freezer till ready to form. I wish I had found this recipe a long time ago. Mine took longer to brown than the time frame in the recipe, but that’s ok. Question – what does the whey protein isolate do to the recipe? I used coconut flour to replace it since I didn’t have any yet. Your picture looks a little “puffier” than mine turned out, would the whey protein make the dough do that? Thanks for the recipe. I just made this again tonight to make ham & cheese handwiches. I finally found a smallish container of unflavored protein powder which I used. I had come across a pizza roll recipe that called for yeast a couple of weeks ago. I did try it but it called for 2 eggs, more cream cheese & less almond flour. Didn’t like it all, was too eggy for my taste. So decided to make this recipe again with the protein powder plus about 2 tsp. of rapid rise yeast. These came out so much better in my opinion. Think this will be my “go-to” recipe from now on when I need dough for a recipe. My next “try” will be to use it for pizza crust! First of all, I absolutely love this recipe!! I’m wrapping everything in it…sausage patties, mozzarella sticks, ham and cheese… I’m so grateful for a keto bread that the whole family loves! Secondly, how would you go about adding yeast to the recipe? I like the idea, but how to execute? Do you still do the warm water thing first and incorporate that into the already wet dough? Process all together? I’m just not this advanced in bread making! I just mixed the yeast in with the almond flour & protein powder Then followed the directions to add it to the wet ingredients. Just ate a leftover ham & cheese handwich I had made last week, for lunch today. Heated nicely in the microwave for about 30 seconds or so. Told my husband that I’m probably going to need a new food processor soon. Mine is about 30 yrs old & find that as I add more dry ingredients to the wet, the motor runs slower. I’m sure the processors they make now have more powerful motors. At least I hope so. Haha! I have been making the mozzarella/almond flour dough for several months & wish I had come across your recipe first. No more hand mixing ever again! Love the use of the food processor & putting it in the freezer. So much easier to work with. Am excited to discover what else I can make with it. Oh my goodness! I am SO excited to have found something to satisfy my craving for pigs in blankets! These were fabulous next time I will add some savory spices for flavor (onion powder, garlic powder, season salt, etc.) as they were very basic but the texture was perfect l. I used half the dough for 3 hot dogs and the second half for pizza I cooked one and froze two. Used the coconut flour method, kept my hands oiled while rolling and they cane out a perfect consistency. So happy to have this recipe! After you make them can you freeze them to eat at a later date (say dinner on the run after baseball practice)? If so any idea how long they may be good in the freezer? 1 month? Yes, Kristen. You can freeze them and thaw in the refrigerator. My husband microwaves them, the texture is never the same as just coming out of the oven, but they are still good. Yes, a month sounds about right. If you have a vacuum sealer probably longer. Making these tonight. They are in the oven! So excited! Yes dough was sticky but manageable with a little practice. Next time I’ll use the freezer idea to help keep the dough a little less sticky. Question…would you add salt on top for pretzel dogs? Thanks again! These were soooo good! Thank you for such a great recipe. Can I use the THM Protien Powder for this? I’m not OP, but have a question along similar lines – I have a baking protein powder from quest that contains whey, casein, and egg protein. Would it be safe to use? I just made these for dinner + added low carb chili on top. AMAZING! THANK YOU! Silly question alert, but I just want to be sure… Does your nutrition include the hot dog or is that just for the dough, 1 “wrap”? Thank you again. My husband and I said we felt like we were cheating on our keto diet… that’s a win. Do you use unflavored whey protein? In my house you are a hero! None of your recipes have ever disappointed us, and this one is no exception. My husband will put away four in one sitting! What a great idea! The dough recipe worked perfectly for me. I used half of it to wrap 4 hotdogs per the instructions, then rolled the other half into a pizza crust shape and refrigerated it to bake the next day for pizza. Everything worked beautifully and deliciously. We had one baked pig-in-blanket left over, which reheated nicely in the microwave the next day. I’m so happy to have this idea and recipe for fun finger food. And thank you for including ingredient weights! Looks great! Have you tried making the dough with a non nut flour? This tree nut allergy is making it hard to try a lot of low carb recipes. Hi, I’m wondering if the dough can be mixed ahead of time and kept covered in the refrigerated until needed later in the day. Just wanting to make some for kids luncboxes. Do they keep well in the fridge? And taste okay cold. This looks really good. The protein powder I use is unflavored Kosher Beef Collagen Hydrolysate Do you think that will work in place of the whey isolate powder? Is the serving size per hot dog? so do you use 1 1/4 PLUS 2 tbsp. almond flour???? I am amazed every time I read your recipes, the things you come up with to replace carbs!!!! 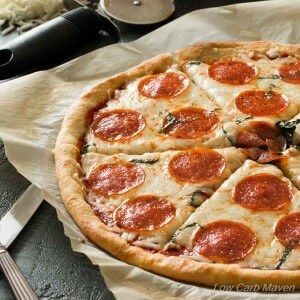 And this dough looks so perfect, I would not think for one moment that there is no flour inside. Just tried it tonight – look amazing. Cook up great – but mine seem a bit dry…maybe too much protein powder?? So instead of whey protein, you can use MORE almond flour?? What a brilliant recipe, combining two all time favourite snacks into one. This is so being tried out in this house. Sorry if this is a silly question…ha. Is the Isopure you use for this the vanilla one, or unflavored? Thanks!! I love bagel dogs! I’ll have to try that recipe for pizza dough! Bagel pretzel dogs!! I love the sound of that. These look so good Kim, I can almost taste them. My kids would be all over these. These look delicious! I definitely need to make a batch for our super bowl party. These just look superb! My first introduction to the Fathead dough was the Everything Bagel Dogs. I loved them – and I’ve loved using variations of that dough for many other things! These look like perfection! I have a thing for hotdogs…. I just love them…. your pictures are making me hungry! Can’t wait to try these in our home! I’ve never tried a bagel dog! But this dough looks amazing!